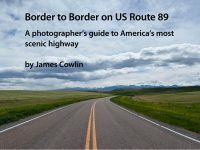 Of all of the questions I am asked about traveling on US Route 89, one of the most frequent is about the two possible drives between Bitter Springs, Arizona and Kanab, Utah. Since both US 89 and 89A are about the same length and take the same time to drive, neither one has a clear advantage over the other. However, each road has unique features and possibilities for exploring this corner of the Colorado Plateau. I’ll describe what you can expect along each road so you can answer the question for yourself. For a map and more information, check out the road trip guides here Flagstaff to Page, here Page to Kanab and here Bitter Springs to Kanab. 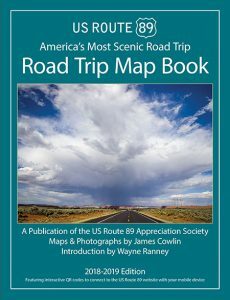 US Route 89A is the original alignment of the highway when it came into existence along with the rest of the federal highway system in 1926. It became an alternative when 89 was rerouted to Page to facilitate the construction of Glen Canyon Dam on the Colorado River. From Bitter Springs it is 14 miles to the low point on this route at the crossing of the Colorado River in Marble Canyon. Navajo Bridge was completed in 1929 as the final connecting link in the border to border highway. A new vehicle bridge was built in 1992. Stop at the visitors’ center and take a walk out on the old bridge to view Marble Canyon and the Colorado River 470 feet below. The road to Lee’s Ferry is on the west side of the river. River trips downstream through the Grand Canyon start here and some of the best trout fishing in Arizona is upstream toward Glen Canyon Dam. You can also visit Lonely Dell Ranch, the home of John D. Lee, now lovingly maintained by the Park Service. For 28 miles through the House Rock Valley, 89A parallels the Vermillion Cliffs. California condors have been reintroduced to make their home here and can be seen along the cliffs and near Navajo Bridge. Stop at the Donimgues-Escalante Interpretive Site to learn about the history of Spanish exploration across the Colorado Plateau. At the west end of the valley, a dirt road goes north along Coyote Wash and eventually connects to US 89 in Utah. Straight ahead is the Kaibab Plateau. For the next twelve miles the road climbs 2,500 feet to the top at Jacob Lake. From here, Arizona Route 67 runs south to the North Rim of the Grand Canyon. This road is only open from the middle of May until the end of October depending on snow conditions. If you are traveling 89A in the off season, be sure to check ahead for current driving conditions. From Jacob Lake, highway 89A descends the west side of the Kaibab Plateau to Fredonia. Pipe Springs National Monument is 13.5 miles west of Fredonia on highway 389. Continue on 89A for 7 miles to Kanab. From Bitter Springs, US 89 climbs 1,000 feet in 3 miles hugging the face of the Echo Cliffs through Antelope Pass onto the Kaibito Plateau. 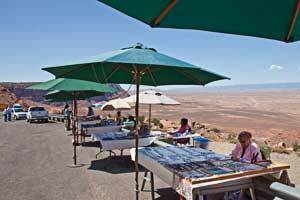 Near the top, there is a small parking area where Navajos set up tables to display and sell jewelry and other craft items. The road slowly descends for 20 miles to Page. Three miles south of Page is short road on the west that leads to an overlook of the Colorado River at Horseshoe Bend. US 89 reaches its low point as it crosses the Colorado at Glen Canyon Dam. The visitors’ centers offers tours of the dam including descending inside the dam almost to river level to view the giant turbines that produce electricity for distant cities. Views of Lake Powell and access to the lake at Wahweap are available along the highway to the west of Page. The road crosses the Paria River 29 miles from Page. 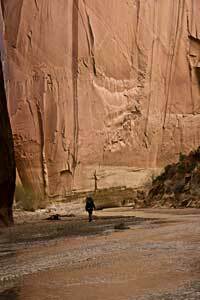 A hike into the Narrows of the Paria is one of the highlights of this section of US 89. Check in at the BLM Ranger Station for a permit and for information on current weather conditions. Flash floods are common on the Paria in the summer rainy season, so proceed with caution. Five miles west of the Paria is the intersection with House Rock Road. 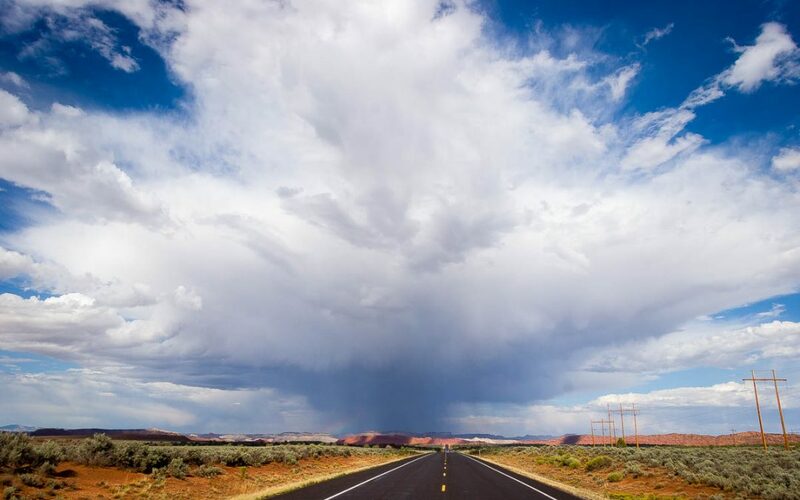 Take the road south to access the Coyote Buttes and eventually connect to US 89A. Permits are required to hike to the Wave and other spectacular rock features along this road and are available at the BLM Ranger Station. US 89 continues west for 40 miles to Kanab. Several people who have asked this question have been driving larger RV’s and are concerned about steep grades. Be assured that both roads can be driven in larger vehicles. They are federal highways and conform to the national standards of construction. 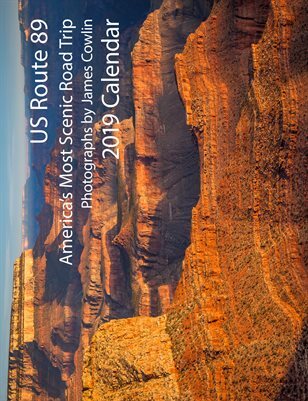 Since both roads connect Bryce Canyon, Zion and Grand Canyon National Parks, they are heavily traveled by tourists in all kinds of vehicles, especially in the summer months. When we travel through this area on a round trip from our home near Tucson, we drive 89 in one direction and 89A the other. That way we can enjoy both roads and avoid having to choose one over the other. If you can only choose one, both are beautiful drives so you can’t go wrong either way. I will be traveling in September with my 90 year old mom. We will be traveling to Flagstaff from St. George Utah and can’t decide witch route to take. My mom will need a lot of rest stops with rest rooms. Should we take highway 89 or take highway 93 to Kingman and then east to Flagstaff. Which route would have more rest areas with bathrooms? I can’t comment on what you will find along the route through Kingman. If you take US 89 you will find convenience stores and gas stations in Fredonia and Kanab. The next possible stop will be Page. From Page to Flagstaff, there is a very nice stop at the Cameron Trading Post where you’ll find clean restrooms and good food. The distance between these places is around 70 to 80 miles or an hour and half driving time. To save time, from St. George I would suggest taking Utah 59 through Hillsdale and AZ 389 to Fredonia, not Utah Highway 9 through Springdale and Zion National Park. And from Fredonia, go to Kanab and pick US 89 there to Page, instead of continuing on US 89A. I hope that helps. we are from Hong Kong, first time planning a driving trip in coming July to Utah, Arizona, will be visiting the Bryce Canyon and the Antelope Canyon. We will be going from Las Vegas. For the onward way to Bryce Canyon, we are planning Highway 15, then Route 9 passing the Zion National Park, then Route 89 and highway 12 to Bryce. Since we will be taking the Route 89 from Bryce to Page, for the return trip from Page to Vegas, we are planning to take the 89a from Bitter Spring, through Jacob Lake to Fredonia, then head back Highway 15 and back to Las Vegas. Both the onward way and the return trip will be done in one full day. And we are probably renting a 7-seater SUV. Do you think that our plans are feasible? Are all the highways paved highways? Knowing the 89a needs climbing up some thousands feet, is it ok for a 7 seater in hot summer day? What things we have to pay special attention to? Would appreciate your advise soon. It is possible to do the trip you are proposing in two days although you won’t have much time for sightseeing in Zion and Bryce Canyon National Parks. If you could add another day or two to the trip, I think you would not be so rushed and would enjoy it more. All of the roads you will be traveling are paved highways. If you rent an SUV you will have no trouble crossing the Kaibab Plateau on US 89A. If you can make time, you should include a visit to the North Rim of the Grand Canyon which is about an hour south of Jacob Lake. Thanks so much James for your advise.. I am thinking of how we can chipping in the Zion National Park or the Grand Canyon North Rim, may be we have to change the hotel plans..
Hey Jim! I have read through all the info and comments but wanted to ask you how 89a is in comparison (if you know) going into Estes Park, CO? Our 2001 dodge dually tends to get a little overheated climbing mountains and we were planning to go 89a to Koibab from Williams, AZ. Is it slow and gradual? Check out the article, Two Alternative 89 Routes, that will give you the information you need. Let me know if that helps. This is one of the coolest highways I’ve been on. The drive from Flagstaff to Kanab is really a fun one, it’s worth taking a trip just to drive it and see it. It’s about as “Arizona Highways” as it gets. 10/10 will drive again. My wife and I are planning a trip to Sedona, AZ this coming March for a camping trip. I had planned on taking highway 89A from Flagstaff to Sedona but noticed on the map that there is section with some switch backs. Since we are pulling a 42 ft. toy hauler 5-wheel would it be better to come into Sedona from the south? Your advice would be much appreciated, since I am not familiar with this area. At the head of Oak Creek Canyon there is a mile or two of switchbacks that take you down to Oak Creek and then into Sedona. We see RVs and fifth-wheelers on the this section so it should be no problem although you’ll need to take it slow. Some RVers we’ve talk to suggest that the alternative is much easier. Your alternative is to take I-17 south to the exit for Sedona at State Route 179. That’s the long way around but avoids the switchbacks and the narrow road through Oak Creek. Once you are parked in your campground you can drive your truck into Oak Creek Canyon which is one of the most scenic drives on the highway. FYI, there are two Alternate 89s. The post refers to US Route 89A. The one you are asking about is Arizona Route 89A detailed in the AZ 89A Prescott to Flagstaff Road Trip Guide. I am making the trip from Flagstaff to Zion staying in Hurricane. I am pulling a 40 Ft fifth wheel. We are going to be making the trip in January providing the weather is acceptable. Can I make the lower route taking 89A without problems? In January weather could definitely be a factor. US 89A takes you over the Kaibab Plateau at about 8,000 feet after a 3,000 foot climb from House Rock Valley. I think you will have less potential problems by taking US 89 from Page to Kanab. Weather can still be a problem but the elevation change isn’t as great. If you are going that way with your trailer, you should consider taking Navajo Route 20 from The Gap to Page which avoids the climb up the Echo Cliffs. From Kanab you can go north to Mt. Carmel Junction and enter Zion on Utah Route 9. Be aware that going that way involves going through the tunnel. In order to do that you need to enter during the day and get a tunnel permit. The Park Service will stop traffic for you so you can safely traverse the tunnel. Check this page on the Zion National Park website for details. will 89a be open this week 3/10/18 between Kanab an rt 89? We’ll be driving from Zion to Grand Canyon South entrance. According to Arizona Department of Transportation, US 89A is currently open. Be sure to check driving conditions and weather closer to the time you will be traveling. If US 89A is closed or the weather look bad, take US 89 between Kanab and Page. Thanks for the information. I have experience pulling my RV over large elevation changes in the Rockies in Montana, New Mexico and Colorado (Lake City). Do you know if the elevation changes are any more severe on 89 in comparison to these areas? My truck is equipped with a good engine assist braking system and I just completed having my trailer brakes maintenance. As long as the highways are well maintained and suitable for big rig travel I will plan to travel on 89. With your experience you should have no trouble as long as there is no severe weather. The elevation changes are fairly gradual. Highway 89 is a federal highway and the section you are traveling has been improved over the last few years. There are lots of passing lanes and it is a major truck route. Have a safe journey. Just checking for current status here since I can’t find much detail about Navajo Route 20 in Arizona on line or elsewhere. I know it was paved years ago and was wondering what current road conditions are like since I’m a new to towing an RV and it sounds like if this route is still paved and in excellent condition that it will be the one I’ll take to help me avoid my fear of taking 89 through Antelope Pass. Thanks. Navajo Route 20 is a good alternative to US 89. I wrote an article about it when it opened as a bypass for 89 when it was closed by a landslide. I drove Navajo 20 about 6 months ago and it is in excellent condition. I am an overly cautious driver, i.e. : chicken, when it comes to hanging on to the side of a cliff. Not my idea of fun just in a car, but being a relatively new RV puller makes it even worse. That said, there is a dreadful hill on 89, right after the 89a split past Bitter Springs. There’s a scenic lookout sign, but I have both eyes on the road and both hands gripping that wheel tight. It sounds like this road is a better bet, though, than 89a. We will be heading back to Phoenix soon, after visiting Zion and Bryce, and can’t wait to get back to Glen Canyon so that stretch of road will be behind me. 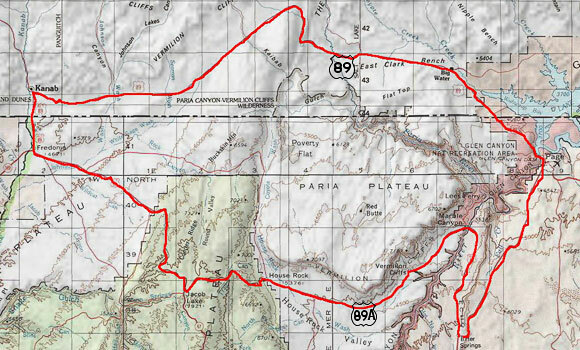 There is an alternative that bypasses the Echo Cliffs section of US 89 south of Page. Take Navajo Route 20 by going south on Coppermine Road. Route 20 rejoins 89 at The Gap. This road was improved during the reconstruction of the Echo Cliffs section of 89 after a land slide and is an excellent alternation especially of RV’s. You can read a more detailed description of this route in my blog post Getting to Page, Arizona, on 89T. Mr. Cowlin your suggestion was miraculous!!! I can’t believe how much easier Navajo Route 20 was, and now I don’t have to rule out a return trip to that area just because of Echo Canyon. We’re actually planning to head back to Page to tour Glen Canyon Dam, and Antelope Canyon in the near future. Thank you again for the help!!! Are there any restrictions for big trucks (18 wheelers) on these routes? Any help would be great thank you! There are no truck restrictions on US 89A or US 89 in southern Utah and northern Arizona. However, 89A is not a good road for trucks because of steep grades and tight turns as the road climbs over the Kaibab Plateau. Given the choice, take US 89 between Kanab and Page. 89A between Kanab and House Rock Valley climbs over the Kaibab Plateau. There are sections on both sides of the plateau where the road is open to views of the valleys on either side. However, as a federal highway, the shoulders of the road are wide and drop offs are protected by guard rails. I don’t recall that there are any places where the road is close enough to the edge to feel unsafe. If you do make the drive over 89A, we would like to hear how you experience it. 89A is scenic, with only some lodges, visitor’s centers and a couple sovenir stores and restaurants. If you get stuck behind a slow driver you might as well turn back. 89 is north of 89A and Flagstaff. Go figure. Between Flagstaff and Page on US 89 there are two places for gas—Cameron Trading Post and a convenience store at The Gap. The restaurant at Cameron is pretty good and serves some Navajo specialties. Of course there are plenty of services in Page. Between Page and Kanab on 89 there is gas at Big Water and a couple of restaurants scattered along the route. There is a BLM Ranger Station about half way that has restrooms. 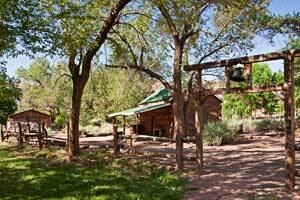 There is a small campground near the ranger station and the entrance to Paria Canyon. On US 89A from Bitter Springs to Kanab, there is gas and food at Marble Canyon just over the Navajo Bridge and at Cliff Dwellers a few miles down the road. The food at Cliff Dwellers Cafe is surprisingly good for a place so far from anywhere. Hatch River Expeditions is headquartered there so there is a nice motel as well as the cafe. The other place to stop on 89A is at Jacob Lake. There is a restaurant and gas station as well as a Forest Service campground there. From Jacob Lake you can take a side trip to the North Rim of the Grand Canyon (about 100 mile round trip) where you will find spectacular views of the Grand Canyon and a great restaurant in the Lodge. There is an overlook point and restrooms a few miles further on toward Kanab. Continuing on 89A the next place with services is Freedonia and then a short distance into Utah. Kanab has several pretty good restaurants. For fine dining try the Rocking V. Historic Perry’s Lodge is great for breakfast and lunch or Houtson’s Trails End offer good fare at reasonable prices. Take a look at the Road Trip Guides on the US Route 89 Appreciation Society website for more information about these routes. Thanks James and Raj for your reply. This info helps out greatly as we plan our trip to Zion National Park, coming from Phoenix, AZ. This website is a wonderful resource for travel details in this part of Arizona/Utah. To the best of my knowledge, Arizona Route 89A between Sedona and Flagstaff is open. The 89A referred to in this article is US Route 89A in northern Arizona between Bitter Springs and Kanab, Utah. US 89 from Bitter Springs to Page is still closed for construction but there is a temporary bypass road. I hope that clears up the confusion. Yes, it does. Too bad the .gov site doesn’t list the section that is closed. Appreciate your response, Cheers ! Hi…we are planning to do one of these routes heading west to east next February in a 30′ Motohome. I am concerned about snow and highway conditions at that time of year and wonder if one route is generally a better bet in the dead of winter. Obviously, weather at the time will govern our actions…including staying put! Your opinion would be helpful! Thanks in advance and for the info above! 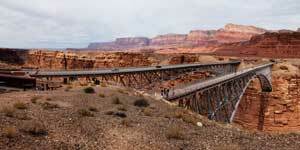 Travel on US 89 between Kanab, Utah, and Page, Arizona, in February is less likely to be a problem than US 89A. There is relatively little elevation change between Kanab and Page. US 89A goes over the Kaibab Plateau climbing from 5,000 feet to 8,000 feet at Jacob Lake and then back down through the House Rock Valley to Bitter Springs where it rejoins US 89. Be sure to check the weather conditions along your route. This blog post has links for highway departments and more: . Have an enjoyable and safe trip. 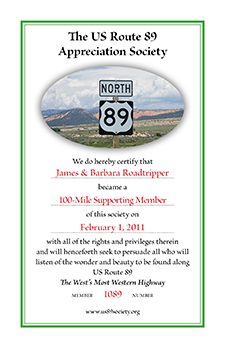 I am planning to drive highway 89A from Kanab to Bitter springs on Sunday, March 31. Everything I can find on line tells me that the weather should be good. Has anyone driven the stretch past Jacob Lake and can confirm that the snow is melted and the roadways clear? My wife and I are at an RV park in Kanab. We arrived here via Zion. Our next waypoint is the Grand Canyon on our way to Albequerque. If possible, we would choose the north rim over the south. We are advised that hwy 89a is an arduous drive between Kanab and Jacob Lake, and less so between Page and Jacob Lake. My drive through Zion was stupendous – other than the stress on my 1995 30 ft Airstream Landyacht motorhome. I would gladly drive around through Page if the stress on my temperature gauge were less than it was through Zion. Can you advise me on this question? Is the drive from Page to Jacob Lake on 89a of less grade than the drive from Kanab to Jacob Lake? I would like to know as soon as possible. To get to Jacob Lake on US 89A from either direction you will be ascending to the top of the Kaibab Plateau. From where you start the climb on either side the elevation change is about 2,000 feet. The distance to the top is also about the same from either direction. We see RV’s and trailers on this road all the time and since it is a federal highway the grades are limited to 6%. If you drive to Page then back to the North Rim you will add at least a half day to the trip. However, the drive across US 89 from Kanab to Page is beautiful. I hope this answers your question and I’d love to hear what you decide and how it works out. We are looking at going from Flagstaff to Page,AZ on 89. I am not fond of heights. Would this be a bad trip if you do not like heights. There is one short section of US 89 when it climbs the Echo Cliffs where there is a drop off on one side. You can avoid that section by taking Navajo Route 20 instead as described in this article. This blog is about the federal highways in northern Arizona. You are refering to what are now Arizona state highways 89 and 89A. The section of US Route 89 and 89A from Flagstaff to Nogales was decommissioned in 1992. Take a look at this blog Where is 89 in Arizona? for details. We have spent a lot of time in the Verde Valley and Oak Creek Canyon. It is one of our favorite areas of Arizona which I always recommend to travelers on historic highway 89. You’ll find a Road Trip Guide for 89A on our website with lots of pictures.